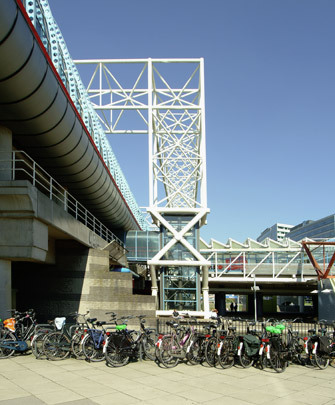 Since Breda (1975) and Zaanstad (1983) larger railway stations have been given a space frame roof. The major junction at Amsterdam Sloterdijk is a recent example of this development. The space frame structure lies like a table of 50x65 m. across two railway lines that intersect at different levels. Between them is a platform for trams and buses and higher up a station hall. The upper railway line is sheltered for 150 m. of its length by a transparent 'tube'.